Prices do not include taxes or setup charges and may vary depending on customisation. 1000 1500 2000 2500 3000 3500 4000 4500 5000 5500 6000 6500 7000 7500 8000 8500 9000 9500 10000 11000 12000 13000 14000 15000 16000 17000 18000 19000 20000 21000 22000 23000 24000 25000 26000 27000 28000 29000 30000 31000 32000 33000 34000 35000 36000 37000 38000 39000 40000 41000 42000 43000 44000 45000 46000 47000 48000 49000 50000 51000 52000 53000 54000 55000 60000 65000 70000 75000 80000 85000 90000 95000 100000 110000 120000 130000 140000 150000 160000 170000 180000 190000 200000 250000 300000 350000 400000 450000 500000 Order now Production time is 2 weeks. You can personalise the token with your logo and text. Your design will be embossed into the tokens. 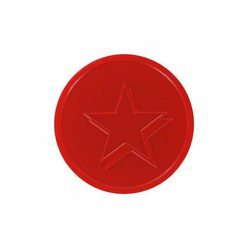 This means that the logo and text will have the same colour as the tokens. 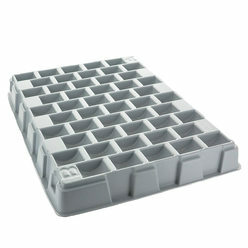 Embossed or relief-printed tokens are made of plastic, size available: 23,3 , 25, 29, 35, 38 mm. Your design will be embossed onto the tokens in the same color as the tuits. The text or logo will be clearly legible and recognisable by touch. These embossed tokens have an edge for your comfort, just like our other products. 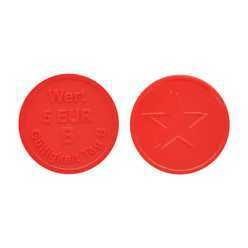 Plastic embossed tokens or coins are widely used throughout various sectors and for a myriad of purposes. In most cases tokens are used as an alternative to money to pay during events, festivals, trade shows, concerts, in bars, clubs, ... In addition tokens are also used as reward, calling card, receipt, shopping cart token, admission ticket. Your logo, company name or website on an embossed token ensures a personalized image and name recognition. 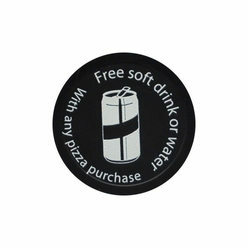 Sponsors, logos or brands will certainly turn heads, when they are on an embossed token. Extensive use of embossed tokens is no problem at all, because they are made of durable and solid materials. What's even more, they are dishwasher safe. Embossed plastic tokens are completely recyclable. The regained material will be used again in a new production batch. Do you have any embossed tokens of b-token that aren't used anymore? We would like to recycle them for you.